This page is incomplete and/or lacking flavor. Reason: Still a lot that is incomplete. Harbingers are dark and vile creatures made from the bodies of both living and dead, Persons and animals alike. These creatures carry far more intelligence than most other undead and solely obey their creator and fallow the directions they where given. Some more powerful Harbingers have a will of their own but never disobey the orders from their master, no mater how much they hate it.. To create a harbinger one must perform a ritual that involves the consumption of hundreds if not thousands of souls. These souls act as a core and energy source of the harbinger, this core also has an influence over how they act with each soul providing their individual characteristics towards it, normally resulting in a neutral and cold approach as the souls cancel one another out. The character knows the fallowing information with a successful Dungeoneering check. DC 16: Harbingers have almost no personality, and will only attack if ordered to, or if a specific trigger occurs, such as someone entering the room. However, they will defend themselves if attacked, and will pursue their target until another requirement has been met. Usually this requirement is "all targets killed." DC 19: Most Harbingers have something known as a "Reaper weapon". These weapons overcharge the core, causing the Reapers to damage themselves with their own attacks. These attacks are incredibly powerful, and are able to turn the tide of a fight. DC 22: Harbingers are made from hundreds, if not thousands of souls. Upon carefully observing the metal they are made of, you can see screaming faces of the dead. The cores have the souls within them, and can be rescued if the core is not damaged. Though if the core is damaged enough, it will explode on death of the Harbinger, destroying the souls of those within. DC 25: Harbingers have a taste for the souls of the living, as it helps charge their cores. If left unfed for long enough, they will starve. DC 28: Though Harbingers can starve, starving them only deactivates them, turning them into a shell. Feeding them souls will reactivate them even if only temporarily. DC 30: Harbingers are both constructs and undead, vulnerable to special techniques against both. However, some are designed specifically to exploit this duality, and ignore barriers placed against either creature. DC 32: If a Harbinger is made with like souls or an unusually strong soul (such as a hero), they will have a personality or traits that come from those they are composed of. DC 38: Harbingers were originally created by an Illithid by the name of Quathira. He is hated by his own kind as they hate the undead and all forms of it. This includes him, by extension of creation. Harbingers rarely work with living beings, other than their creator, and even under the orders of their master they will not hesitate to sacrifice their living companions if they deem it necessary or worthwhile. Normally Harbingers work with undeads, elementals and other harbingers as the life force they gain from consuming them is minimal. The Reaper cannons within the head of the Harbingers is never used without a great deal of consideration as it deals damage to it's user. Creatures that spend a healing surge in the aura take 5 poison damage. Hit: 1d8 + 4 damage and ongoing 4 Acid damage (save ends). Hit: 1d8 + 4 damage and ongoing 4 Poison damage (save ends). Effect: The mouldering harbringer makes two venom arrow attacks. Hit: 1d10 + 5 necrotic damage and ongoing 4 necrotic damage (save ends). Effect: The mouldering harbringer takes 1d4 + 3 damage. Hit: 1d6 + 3 poison damage and the target takes a -3 penalty to saving throws until the end of its next turn. The Moldering Harbinger is a failed attempt at creating a harbinger, it's life span is very short with the necrotic energy that pours out of it causing many vile growths upon it including a black mold that releases toxic spores into the air, creating a toxic cloud around the harbinger. When in combat a Moldering Harbinger will stay at the rear and attack relentlessly attacking with Venom Arrow and firing it's reaper cannon whenever it's foes group together and it is available. As it's enemies approach the harbinger will slowly backpedal to avoid melee combat. once the majority of it's enemies are in range it will use spore burst and then switch to melee combat but it will still use reaper cannon when available and fire to cause maximum damage regardless of damage to its self. DC 14: Moldering Harbingers are the weakest harbinger, being a failed creation of a more powerful harbinger. Typically found abandoned in old lairs of necromancers, or lost in the shadowfell. Though some lesser necromancers will gladly convert these harbingers to bolster their more common undead. DC 21: Moldering Harbingers can also be made on purpose with large scale rituals allowing for the creation of several at a time for far less material cost than other Harbingers. Hit: 2d6 + 6 necrotic damage. Effect: The deceiving harbinger makes two twin shuriken attacks. Hit: 2d4 + 4 poison damage and the target is dazed and takes a -2 penalty to saving throws (save ends both); First failed save: The target is blinded (save ends); Second failed save: The target falls unconscious (save ends). Hit: The deceiving harbinger is invisible to the target until the harbinger moves. Effect: The deceiving harbinger uses an illusion to appear as a Medium humanoid until it uses blend in the crowd again, drops to 0 hit points, or is hit by an attack. To look like a specific individual, the harbinger must have seen that individual. Other creatures can make a DC 23 Insight or Perception check to notice the illusion. The Faulty Deceiving Harbinger appears to be a humanoid race but are actually a Grey metal skeleton coated with a magical clay that looks, and acts like normal skin (for that species) though it feels like it is made of clay. When hit with moderate force the clay covering shatters into a ceramic like material. The Faulty Deceiving Harbinger like his more powerful brethren have their reaper cannons replaced with a device that allows them to fold change their shape and size to some degree as well as mold themselves skin from magically generated clay. Although this Harbingers Guise generator is broken, damaged, or faulty both making the harbinger easier to spot and much less powerful. Faulty Deceiving Harbingers often attack in pairs with hired thugs too assist them, they often prefer weaker partners as it allows them to be rid of them later, harbingers usually attack in a populated area, and with unnoticeable weapons trying to wear down there opponents from afar and under a guise. other wise they set up ambushes and try to target the party one at a time. A Faulty Deceiving Harbingers stay back at the beginning of the battle using twin shurikens and shuriken storm to gauge the strength of the opponents. Once the Harbinger has determined the strongest opponent it will attack them using cursed claws, then immediately fallow up with Neurotoxin using it's action point if available. If the Neurotoxin lands a hit it will disengage from the target and seek out the next strongest opponent but still stay within range of the Neurotoxined foe. Once the target falls unconscious the harbinger will Coup-De-Grace it using Black Blade repeatedly until the target is slain. From here on the Faulty Deceiving Harbinger will seek out the strongest of the party using Impale as often as possible, and using shurikens to spread out damage. When Bloodied the deceiving harbinger uses Cursed Claws on the closest target and aggressively seeks to destroy this foe, once this targeted enemy is slain the Harbinger returns to normal attacking patterns. DC 16: Faulty Deceiving Harbingers are relatively weak as harbingers go. They are often used more often as spy's and units of espionage, although they are still apt assassins more than capable of handling most common targets such as a witness. DC 23: Faulty Deceiving Harbingers are not actually failed creations as their name would imply they are specifically designed to be infiltration units and are made with a mass ritual to produce several at a time, though rituals to produce an individual harbinger also do exist. The Scarab harbinger is a giant black scarab with a gleaming shell, having large bladed pincers and a flaming glow of heat from where it's mouth would be. It's legs are robust and end with large spikes that digs into the ground leaving holes where it steps. Scarab Harbingers hunt in large groups focusing on individual targets and trying to stay away from harder hitting foes. The scarabs prefer to use their reaper cannon once a group of foes make an approach on a damaged scarab. The Scarab harbingers let out a cry that sounds like a sharp point of bone being scraped across metal that indicates it's intentions to fire the cannon. The rest of the scarab harbingers will also fire their cannons at this point at time on the same targets if they can, even abandoning current engagements to join in the volley. DC 17: Scarab Harbingers are one of the weaker harbingers. They tend to be quite common as harbingers go and are often found in packs as they are most effective in groups. Typically used as shock troops in large scale combat or for ambush in lairs and secluded pathways. DC 25: Scarab Harbingers carry a substantial ritual cost for their power, however they only require the sacrifice of swarms of vermin rather than people. This makes their creation far less suspicious and thus making them is easier when under suspicion. Effect: The Grey Skull Harbinger is killed. The Grey Skull Harbinger is simply a grey metal floating skull, crackling with electricity and with a blue glow in it's eyes. The Grey Skull Harbingers swarm fire at multiple targets to deal damage around as supporting creatures. When attacked in close combat the Grey Skull will immediately charge it's core to critical levels causing it so explode. DC 19: Grey Skull Harbingers are both powerful and fragile often used as supports for other creatures. Many can be found within structures to protect their fragile bodies acting more like a trap than a standard creature. Grey Skull Harbingers can be found in a variety of locations and even weak necromancers can manage to create some without to much difficulty. DC 27: Grey Skull Harbingers are quite easy to create in terms of material costs, with only a single human soul each. Additionally they don't require much life force to maintain allowing them to remain independent long after the passing or abandonment from their master. Skeletal Harbingers are simple black metal skeletons with a cube shaped obelisk within its ribcage. They have sharp teeth and burning red dots for eyes. They move like a normal human until they enter combat. Once in combat they act and move like a madman rearing their heads in a scream before charging into combat with their hands splayed out. Skeletal harbingers use little tactics within their assaults but often try to flank a single enemy and focus on taking it down, if they can they will push the defending line back and once in range of the more venerable targets unleash it's Reaper Blaster. If other members of the group are weakened than one stronger harbinger will lash out with Wrathful Flurry and force it's enemies to focus on it. DC 20: The Skeletal Harbinger is the backbone of the Harbingers. Strong plentiful and effective. Few Skeletal Harbingers can take on a force far larger than themselves and their high intelligence allows them a degree of independence and the ability to execute limited tactics. They can be found almost anywhere executing the orders of their master. DC 28: Skeletal Harbingers can be created by a relatively effective ritual for their strength making them a desirable creature for any overlord. Effect: The decrepit harbinger lord takes 2d10 + 10 damage. Hit: 2d8 + 10 fire, 2d8 + 10 necrotic and 1d8 + 5 acid damage. The Decrepit Harbinger Lord is a black metal Skeletal construct that appears to be human in origin. It wears a torn cloak, fragmented chainmail, and has a cracked crown of a blood red metal that appears to be fused to it's skill. Due to it's age, miss care, or lack of a master or energy it has fallen apart to a more feeble state. Many parts of the are damaged to near unusable state and it is severely crippled where it is not damaged due to compensations for power loss though sparks and bolts of energy jump across the surface of the Harbinger letting off loud noises and flashes of light. The Decrepit Harbinger Lord moves in a crippled manner though it is barely hindered by this movement. The Decrepit Harbinger Lord surprisingly is non-hostile willing to let most foes go and negotiate with them rather than fight. Though they will not simply give the adventures what they wish, most will want something in return and depending on how important it is to harbingers last assignment and the wishes of their master or even their own plans, they may outright refuse. The Decrepit Harbinger Lord opens combat with Necros beam against the defender of the party then fallow up by falling back and using Reaper bolt, Keeping the defender as one of the targets. When enemies get to close together the Decrepit Lord will use the Reaper Cannon, but only if it can catch most all enemies within the blast. When enemies get within melee range the Decrepit Lord will attack with Decrepit Blade then teleport out with Shadow boom when available otherwise it will hold it's ground or get into a defensive position. Depending on how the combat is going when the Decrepit Lord becomes bloodied it can go to one of two opposing tactics. If the combat is going well the Decrepit Lord will play it safe stopping the use of it's Reaper Cannon and staying away from damage. If the combat is going poorly for the Decrepit Lord then it will become very aggressive, spreading out ongoing damage and using the Reaper cannon until either it or it's foes are down. Once the Decrepit Harbinger Lord is down the Catalyst Cell activates, blasting all the targets within range. DC 21: The Decrepit Harbinger Lord is the weakest of the completely independent harbingers. Normally found within their own lairs or by a particularly important object to their master. DC 29: These harbingers are heavily damaged, operating at only a fraction of their former power often falling into disrepair through errors of their ritual, damage in combat, or simply wear over the ages. The presence of a Decrepit Harbinger Lord almost always indicates the demise of their original master though it does not mean they are parented to be without one. Effect: Flayed harbinger takes 2d12 + 6 damage. Flayed Harbingers are Rusted Metal Skeletons with barbs and spikes protruding out of their bones, these barbs and spikes cling to slabs of flesh that are haphazardly thrown onto them. These pieces of flesh appear to be alive, writhing on their barbs. The most notable features of the Flayed Harbingers are their long, barbed, and rusted claws in addition to their eye sockets which appear to have been grown over with what would have been bone. Flayed harbingers move in a manner that displays heavy exhaustion, heaving their bodies even when simply standing. Most have a heavy hunch to their posture in addition to arms that are notably longer than they should be, often having their claws drag upon the ground. Flayed Harbingers rarely speak and if they do it is in a deep yet immensely loud synthetic tone more similar to a roar or scream than actual speach. These harbingers are very sadistic taking great pleasure in causing immense pain to others. If you are unlucky enough to be captured by one of these Harbingers it will take great pleasure in tearing you limb from limb, ripping out your eyes, tongue, and teeth and tearing out your innards with it's teeth. Once a prisoner has become boring to a Flayed Harbinger the prisoner will be tossed into a pile of corpses and waste to die from its wounds, disease, and starvation alike. The Flayed Harbinger lacks intelligence and tactics, choosing to simply charge into battle and tear apart it's opponents. The Flayed Harbinger will throw rending flesh from it's body onto those it cannot attack directly while lashing with it's Sadist's Claws. When the Flayed Harbinger downs their opponents they choose to knock them unconscious (with intense pain) rather than killing them. Flayed Harbingers are much less careful with their Reaping Maw that most other harbingers with their equivalents, taking any opportunity to bite a chunk out of their opponents. DC 22: The Flayed Harbinger is a terrifying being that almost exclusively lives withing their lairs or the dungeons of their master. They are feared above all other harbingers as being defeated by them is a fate worse than death. DC 30: Flayed Harbingers are expensive both in time, materials, and effort. They require the souls of those who are particularly sadistic and enjoy torture as an art. However they generally aren't created with combat in mind. Although They Flayed Harbingers are immensely powerful they are most useful in draining the life force from living creatures. Many people see their acts as pure torture but they are one of the few creatures for whom torture is the art of draining one's life to the very last drop. Hit: 2d10 + 14 necrotic damage. Hit: 3d10 + 15 damage ; On Crit: 10 ongoing damage (Save ends). Hit: 4d6 + 10 necrotic damage and the target is dazed and takes a -2 penalty to saving throws (save ends both); First failed save: The target is blinded (save ends); Second failed save: The target falls unconscious (save ends). Effect: The deceiving harbinger uses an illusion to appear as a Medium humanoid until it uses blend in the crowd again, drops to 0 hit points, or takes a single hit dealing 45 damage or more. To look like a specific individual, the harbinger must have seen that individual. Other creatures can make a DC 31 Insight or Perception check to notice the illusion. The Deceiving Harbinger appears to be a humanoid race but are actually a Grey metal skeleton coated with a magical clay that looks, acts and feels like normal skin (for that species). When hit with a strong force the clay covering shatters into a ceramic like material. The Deceiving Harbinger has it's reaper cannons replaced with a device that allows them to change their shape and size to some degree as well as mold themselves skin from magically generated clay. Deceiving Harbingers often attack in pairs with hired thugs or lurking monsters too assist them, they often prefer weaker partners as it allows them to be rid of them later, harbingers usually attack in a populated area, and with unnoticeable weapons trying to wear down there opponents from afar and under a guise. other wise they set up ambushes and try to target the party one at a time. A Deceiving Harbingers stay back at the beginning of the battle using twin shurikens and shuriken storm to gauge the strength of the opponents. Once the Harbinger has determined the strongest opponent it will attack them using cursed claws, then immediately fallow up with Neurotoxin using it's action point if available. If the Neurotoxin lands a hit it will disengage from the target and seek out the next strongest opponent but still stay within range of the Neurotoxined foe. Once the target falls unconscious the harbinger will Coup De Grace it using Impale. From here on the Deceiving Harbinger will seek out the strongest of the party using Impale as often as possible, and using shurikens to spread out damage. When Bloodied the deceiving harbinger uses Cursed Claws on the closest target and aggressively seeks to destroy this foe, once this targeted enemy is slain the Harbinger returns to normal attacking patterns. DC 22: The Deceiving Harbinger is one of the finest espionage and assassination creatures there are, so much so that they are often requested upon by those otherwise un-involved with the dark arts. They are nearly impossible to spot among a crowd though a sufficiently strong hit will break their false skin and expose their true nature. In most cases discovering the Deceiving harbinger is more of a challenge than actually fighting it. Though they should never be underestimated. DC 31: The deceiving harbinger is a ruthless hunter made from the souls of assassins, spies, and mercenaries. Their killing nature is nearly unparalleled and their bloodlust insatiable. Hit: 3d8 + 12 damage and the target is grabbed. While in this grab the target acts as if they were petrified until the grab is broken (DC 28). The target may only make actions to break out of the grab while grabbed. Effect: The Spider Harbinger grants combat advantage until the end of its next turn. Hit: target must make a saving throw with a -2 penalty (the saving throw carries the poison keyword). On a fail the target is immediately reduced to 0 hp. On a success the target takes 2d6 + 6 fire damage and 2d12 + 12 poison damage. Effect: Spider Harbinger jumps up to 14 squares (but no less than 4) before making this attack. The Spider Harbingers are large black metal spiders with thick purple smoke escaping from its joints and orifices. Each of these spiders has a body length of approximately 7' with legs that are about 5' when fully extended. The Spider Harbinger is nearly silent with no visible glow from eyes or joints. Unlike most Harbingers the Spider Harbinger is matte black making it nearly impossible to spot. The Spider Harbinger moves in a smooth elegant manner, the speared legs barely making a sounds as they peirce into the ground. The Spider Harbinger often rears up on its legs to Intimidate and frighten off unwanted intruders to its layer. The Spider Harbingers are made as a multipurpose spy and assassin. Most often they draw the attention of commoners who mistake them for less powerful spiders, thus luring ill prepared adventurers to their doom and remove potential threats from their masters plans. Spider Harbingers are more limited in their options when compared to most other Harbingers. As such they keep to simple but effective tactics. These Harbingers try the best they can to lure a lone adventurer from the group attacking in a pair one leaps at the target while the other uses its steal web on the opponent. The other Spider Harbinger having used an action point to prepare the Reaper Venom will strike the now webbed adventure likely ending his/her life. As this tactic is not easily pulled off in most times a variant is pulled where the spiders engage and disengage before retreating on either a success or failure. DC 23: Spider Harbingers are adept hunters often going after targets in forests where their mobility can be best used and line of sight is easily broken. These creatures tend to hunt in pairs as to maximize their chance of downing their target. Often lingering in battle just long enough to confirm the kill before retreating from combat. DC 31:Spider harbingers require a massive sacrifice of vermin and beasts. They are often used for spies and have been employed by many dark forces across the ages. Effect: Titan Harbinger may shift up to 3 before the attack, In addition the area of the attack becomes a zone of rough terrain until the beginning of the Titan Harbinger's next turn. Titan Harbingers are most easily described as giant grey metal skeletons. Normally 22 feet tall with larger than normal bones and large fragmented teeth in their mouths. Titan harbingers move in slow giant strides pounding the ground with their fists and feet literally crumbling the earth with their steps. Titan harbingers also have completely soulless eyes, and what appears to be fractures and healed breaks on their bones. Titan Harbingers are in a constant rage screaming in pain and anger lashing out at anything that moves. Nothing can stop a Titan Harbingers rage, it will smash and decimate everything it can break until it is fragments its self. The Titan Harbinger seeks constant destruction as such it will strike with its reaper mortar when not in range and smash everything it can with it's fist and feet. DC 24: Titan harbingers ravage the lands they roam, often found as a form of siege engine. Titan harbingers are also often chained to their posts unable to seek the ending of their misery. DC 33:Titan harbingers are made from the souls of the tortured and enslaved, bound to this form to be tortured again in their own undeath. Often made from disobedient slaves they indicate a particularly sadistic master willing to cause endless torment for power. Hit: 4d6 + 17 damage. Hit: 3d8 + 15 necrotic damage, and the Death Knight Harbinger spends a healing surge. Miss: The power is not used. Miss: Half damage, If the miss is on the first attack the power is not used up. Effect: Make a basic melee attack against the attacking creature. The Death Knight Harbinger is a Black steel skeleton dawned with full plate armor with a versatile superior weapon of it's choice. This Harbinger moves in a very elegant and efficient manner. When the Death Night Harbinger uses it's Reaper Cannon it's head temporarily ignites from it's remaining rot. The Death Knight Harbinger is often used to slay troublesome creatures, and to complete dangerous tasks for its master. The Death Knight Harbinger is an incredibly aggressive combatant, often opening with it's Reaper cannon if it's opponents are grouped together. Next the Death Knight Harbinger will attempt to get into a position where he can pull off a masterful flurry on the entire group that he is in combat with, moving into cover to draw out the ranged attackers before turning towards the attackers and devastating their lines. At this point the harbinger will engage targets as they come using Iron Strike to engage in melee combat and the reaper cannon to get shots off at groups or the ranged combatants. When a foe is particularly venerable or their is a advantageous position that the harbinger feels he must remove an enemy from he get just into range and attempt to not expose it's plans, then as soon as it can it will teleport directly beside the target and proceed to destroy the target until the melee units catch up with him again. When surrounded the Death Knight Harbinger will use Sweeping Strike to attack all aggressors at once and when against an isolated target use Dark Weapon to deal extra damage. The Death Knight Harbinger usually only use Flawless Recovery when he misses with Vampiric Maw or Masterful Flurry but in some cases will use it on a particularly important reaper cannon or Iron Strike. Once a Death Knight Harbingers is Weakened to the point were he feels the battle is lost he will prioritize one single target and attempt to take it down with all of his furry. DC 26: The Death Knight Harbinger is an powerful battlefield commander, able to lead it's troops from either the front-line or the rear. The Death Knight Harbinger is a king of the battlefield able to deal and take huge amounts of damage and deal with multiple foes. They are created for war and nothing more. DC 35: Creating the Death Knight Harbinger is quite difficult as it requires the souls of those who love the art of battle but aren't sadistic in their tendencies, making the Death Knight Harbinger very rare. There are methods of distilling and changing the nature of souls but this is an entire challenge on it's own. Effect: Area becomes a zone that deals 2d8 + 6 necrotic damage to creatures that enter or start their turn in the zone. This zone lasts until no living creatures are in the zone. The Harbinger Lich is a tall slender skeleton of bleached bones that shine like metal, dawned in a pitch black garb reminiscent of a reaper. The Harbinger Lich has glowing yellow eyes and a black aura around it that seems to steal light from around it. Carrying a staff and dagger the Harbinger Lich moves with ridged and harsh motions performing spell and maneuvers with flawless mechanical precision. The Vile Guard is a skeletal being of broken and shattered bones dawned in nearly useless plate armor but the sheer necrotic energy of this being holds it together and harms all those who dare approach it. This creature shutters with every hasty step with a thick black energy dripping of its body obscuring portions of it as it rots the surroundings. The Vile Guard is very simple minded get between its master and the threat, then cut the threat into tiny pieces. DC 27: The Harbinger Lich is a new kind of immortal necromancer, feeding off the very essence of life. They summon hordes of undead and can even create other harbingers if the need arises. These very Intelligent and cunning harbingers are often aggravated being in the service of a feeble master and as such may very well slay their creator to pursue goals of their own. DC 37: The Harbinger Lich is one of the few harbingers created with a prime soul. Normally the soul of a previous necromancer this soul is empowered with the sacrifice of other souls allowing it to be the driving personality of the Harbinger. This can often lead to this necromancer effectively being resurrected though their mind may be altered due to their evil body. The Frozen harbinger is a transparent skeleton dawned with white metal chain armor and sword. It stands about as tall as a human with a straight posture moving with swift movements. The harbinger would be nearly invisible if not for the constant storm that whirls around it and the black "glow" that it emits distinguishing it's necrotic energies. Frozen harbingers are ruthless combatants trying to focus down one foe while controlling the movements of others with various hindering effects. The Frozen harbinger avoids direct combat at all costs as it cannot defend itself effectively when met in close combat. whenever an enemy marked by the Soul Harbinger attacks a creature other than the soul harbinger they take 15 psychic damage. Hit: 5d6 + 18 Necrotic damage. Once the Blazing Harbinger is bloodied all creatures that enter, or start their turn in the aura take 8 fire damage and 8 necrotic damage. Hit: 4d6 + 11 fire damage and 11 necrotic damage. Effect: the square occupied by the target and all adjacent squares becomes a zone of fire. Any creature that enters, or starts its turn in the zone takes 10 fire damage. The zone lasts until the end of the encounter. Effect: The blazing harbinger takes 3d12 + 6 damage and 2 ongoing damage (save ends). If it is not bloodied, its black fire aura aura becomes active until the end of it's next turn. Effect: The blazing harbringer makes a flame blade attack and shifts 3 squares. 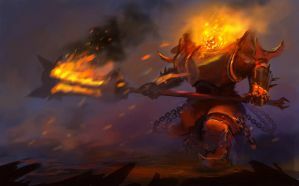 The Blazing harbinger is a red-orange metal skeleton that is flaming (similar to a blazing skeleton) with a Black-red Fire, it moves in a sudden and twitchy way, but otherwise is nearly still. The Blazing harbinger uses the flair cannon on groups of enemies and the Reaper bolt on single targets. Once significant casualties have been had on the harbingers side it switches to the Reaper cannon rather than the Flair cannon, and once bloodied uses the reaper cannon as often as possible if its foes still seem strong. The Deceiving King slayer may make a saving throw at the beginning of it's turn against any one condition that hinders it's movements or limits it's turn. Hit: 3d12 + 18 damage. Hit: 1d10 + 10 damage and 2d10 + 10 Necrotic damage. Hit: 5d12 + 30 damage ; On Crit: additional 5d12 damage. Hit: 3d8 + 12 Poison damage and the target is dazed and takes a -2 penalty to saving throws (save ends both); First failed save: The target is blinded (save ends); Second failed save: The target falls unconscious (save ends). Effect: While in this stance the Deceiving King Slayer gains a + 1 to attacks VS AC, +2 to speed, and an additional Minor action on it's turn. Though for each turn it begins while in this stance it takes 20 damage, and 2 ongoing cumulative damage (Save ends). No resistances are applied to the damage caused by this stance and the cumulative ongoing damage cannot be saved for until the stance is ended. Effect: The deceiving harbinger uses an illusion to appear as a Medium humanoid until it uses blend in the crowd again or until it drops to 0 hit points. To look like a specific individual, the harbinger must have seen that individual. Other creatures can make a DC 39 Insight or Perception check to notice the illusion. The Deceiving King slayer almost exclusively works alone and will rarely let its self be seen. When the King slayer does require additional units to assist it will almost exclusively work with other Deceiving Harbingers, and never with any creature that could chance ruining a surprise attack. The Deceiving King Slayer will never willingly enter combat without a designated target, either by command or which ever of the group has proven to be leading the group from it's observations. Once the King Slayer has determined it's target it will set up and ambush and wait as long as it thinks needed. Once entered into combat the King Slayer will immediately go towards it's intended target and attack them using Knife of Doom, then immediately fallow up with Neurotoxin using one of it's action point if available. If the Neurotoxin lands a hit it will disengage from the target and seek out the next desired opponent but still stay well within striking range of the Neurotoxined foe. Once the target falls unconscious the harbinger will activate it's Core overdrive and Coup De Grace it using Impale and it's remaining action point. If the target upon the ground is not dead it will remain within overdrive and repeatedly attack the opponent until nothing remains but an eviscerated pile of flesh. From here on the Deceiving Harbinger will seek out the most desirable opponents of the party using Impale as often as possible, and using shurikens to spread out damage though no longer in Overdrive. When Bloodied the deceiving harbinger uses Knife of Doom on the closest target and aggressively seeks to destroy this foe activating overdrive if it deems it necessary. Once this targeted enemy is slain the King Slayer will attempt to disengage from combat while trying to damage it's opponents as much as possible. If the Neurotoxin fails to land on it's intended target the Deceiving King Slayer will enter an enraged state of sorts. While in this state the Deceiving King Slayer will enter overdrive as often as possible though never letting the cumulative damage build over ten. In addition the Deceiving King Slayer will go after those that are causing it the most trouble with it's attacking (normally the one that currently has it marked) and proceed to slay the entire party in this manner if possible. Once bloodied it will realize it's error and attempt to escape if possible, though it's more than willing to murder those around it. Nethirhem Archmeus has a +3 to attack rolls and a +10 to damage against creatures with the Undead, or Shadow keyword. Whenever any creature within the aura spends a healing surge the creature only receives half value while Nethirhem receives the other half. Creatures provoke opportunity attacks from Nethirhem two squares away. Nethirhem may still take immediate actions while stunned, dazed or dominated. Nethirhem may make a saving throw at the beginning of it's turn against any one condition that hinders it's movements or limits it's turn. Effect: an additional attack is made with the fallowing characteristics. Effect: Enables the use of Maelstrom Bolt during this turn and grants a + 1 to all defenses until the beginning of Nethirhem's next turn. Hit: 1D12 + 6 damage and 2d8 + 8 fire damage. Effect: All square within the attack (including those occupied by Nethirhem) are concealed in a thick smoke that provides concealment (Nethirhem ignores this concealment due to true sight), this zone lasts until the end of the encounter or until it is dispelled with an Arcana, or Religion check using a standard action (35 DC). In addition whenever Nethirhem is completely within the smoke he becomes insubstantial and counts as existing in all square that are covered with the Stalkers Shadow for the purposes of attacking being attacked and moving. As such Nethirhem can enter one Stalkers shadow and exit another in a single move action, alternatively Nethirhem can use the Stalkers shadow to walk through saving it movement points. Although while Nethirhem is within the Stalkers Shadow creatures can still move through it as normal and Nethirhem cannot exit in such a way that it will occupy the same square as an enemy as per normal movement rules. Effect: Nethirhem makes a basic melee attack that includes the triggering enemy as a target. Equipment Eye of the Seer, Ancient's Stone Mail, Hell-walk Grieves, Nethirhem's Rage, Ancient's Tempest Bow. Nethirhem Archemus is a 12 foot, four armed creature that resembles a human in shape. It has the legs of a pale blue jackal. Arms of blue white skin with four fingers with the flesh worn from the second joint of the fingers on exposing the black steel bone. The head, chest, and torso are a black bone. Upon each of the arms are solid adamantine bracers with golden trim, with orange metal and gold shin guards with black leather straps. The chest plate is of several small stone looking pieces linked together as hex shapes. A wrapping of cloth covers the lower part of the body. The Skull head is adorned with a bronze piece of metal extending from the chin a few inches and a pale stone obelisk extending directly upwards from it's face with the back of it starting at the forehead. The Obelisk the is about one foot tall, and has two extensions at the base that covers Nethirhem's eyes, and a glowing eyelike circle that hovers just in front of the obelisk at the top. A black mist flows out from the monster and trails along the ground lingering for an extended amount time with the scents of death and rot that fills the air. Nethirhem's Rage is a huge Khopesh made out of some unknown sandy stone similar to the material of his chest plate. This ornate blade can cleave into adamantine and break mythril like glass. The Ancient's Bow requires all four of Nethirhems arms to pull back. Made out of the same unknown stone and what appears to be mythril. The bow has a ring at the center allowing what would normally be the arrow to pass straight through however, there is a metallic piece which attaches to the string instead. When pulled back lightning arcs from the rod to the ring in the center of the bow growing more frequent and intense the more the bow is drawn back. If fully drawn (which takes a great effort for Nethirhem to do) the release sends forth a crack of lightning far more powerful than anything that could compare in nature, making a blue dragons lightning seem petty in comparison. Nethirhem Archemus never wants to enter combat without the upper hand. He lures his prey into the deepest parts of his lair hiding in the shadows and waiting for an opportune moment to strike, though he does take the time to set up as many Stalkers Shadows as possible before hand to maximize his mobility, normally having one in the center of the arena as a convenient striking point and to draw the attention of his foes. Nethirhem often opens with the Maelstrom bolt with any shadow or undead creature as the primary target otherwise he generally targets the most venerable member of the group providing he still hits as many targets as possible. Nethirhem will continue to stalk in the shadows for several rounds provided he can remain effectively concealed within the shadows. Once Nethirhem is satisfied with his ranged assault or cannot keep himself hidden he will attack up front switching to Nethirhem's rage and beginning melee combat. Once shifted (or forced) into melee combat Nethirhem will savagely attack a chosen target (normally one of the parties defenders) using Devastate and Cleaving blow to focus down the damage while also using flame walk when available to give damage to other members of the party. If Nethirhem feels that he is getting into a disadvantageous position he will withdraw to a Stalkers Shadow (if available) and attack with the Ancient's Tempest bow unleashing the maelstrom bolt if available. If one of Nethirhem's foes is separated from the group and relatively venerable he will reprioritizes him as a target to take down. Nethirhem doesn't often use the Reaper cannon but when he does he ensures that it will have maximum effect. Once bloodied Nethirhem avoids the use of his Reaper cannon and attempts to destroy his foes in a systematic manner. Almost exclusively taking acting from within the Stalkers Shadow. If down to the last inch of his life Nethirhem will use one last reaper cannon in an attempt to exterminate his foes. Upon "Death" Nethirhem enters a state of inactivity for 2d4 + 1 hours. An arcana or Perception check against a 38 DC can determine that Nethirhem is actually inactive and an arcana check against a 45 DC to determine how much longer Nethirhem will be inactive. While in this inactive state Nethirhem takes the statblock of Nethirhem Core but with and additional 50 resistance to all damages while inactive, in addition to ignoring the Exposed Core trait during this time. Nethirhem has a +3 to attack rolls and a +10 to damage against creatures with the Undead, or Shadow keyword. Whenever a creature enters or starts it's turn in the Aura it takes 15 necrotic damage and 15 lightning damage. Hit: Target is killed and is reduced to a fine ethereal dust along with everything occupying the square (including equipment and environment (Magic items are reduced to their value in residum)). Effect: Nethirhem Takes 5d10 + 25 damage and 20 ongoing damage (save ends). In addition the square occupied by the target becomes a zone that lasts 6 days. Any creature that starts it's turn in or enters the area takes 20 ongoing damage(Save ends). Hit: 1d12 + 6 Necrotic Damage, 1d10 + 5 Lightning damage, and 1d8 + 4 Thunder damage. Effect: All square within the attack (including those occupied by Nethirhim) are concealed in a thick smoke that provides concealment (Nethirhem ignores this concealment due to true sight), this zone lasts until the end of the encounter or until it is dispelled with an Arcana, or Religion check using a standard action (35 DC). Trigger: Nethirhem is reduced to 0 hitpoints and has had his core hit with at least one critical. Equipment Eye of the Seer, Soul-Steel Plate, Hell-Walk Grieves, Soul Drinker Daggers x4. Reactivating with a large explosion Nethirhem tears open his already ribs grabbing four giant daggers while exposing his core. This pale pink octahedron spins on a vertical axis releasing a shrouding smoke and a wavering hum. Whenever the core is hit it sounds like shattering glass and a thousand screams with Nethirhem roaring in agony. If hit with a powerful enough attack the core will crack and the humming will begin to sound like muffled screaming. Nethirhem moves with vicious speed, charging in with flame walk and attacking with Reaper Cannon and Revenge, expending an action point to do so. Nethirhem will keep steady damage with Daggers Flurry using whatever attacks are available to him. If a target is prone he attempts to move adjacent and grab the target, if successful he will use an action point to use Reaper's Focal Termanis in an attempt to obliterate the target. once bloodied he will try to use sacrifice on the most venerable target allowing him to regenerate his health. After words he will attack viciously and disengage when none of his more powerful attacks are available.